It's Facebook Fridays! for October 23, 2015, and in this spooky season we want to keep you safe! The Lucky Mojo Curio Company is hosting a random drawing to give away 10 powerful Protection spiritual supply prizes. 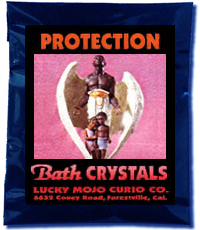 This week the prizes are 5 bottles of hand-made Lucky Mojo brand Protection Dressing Oil, and 5 packets of Protection Bath Crystals. First thing tomorrow morning, we will select TEN winners at random, announce their names here, and ask them to message this Facebook Page with their mailing addresses, so we can send them their FREE Protection products. We have a winner! In fact, we have 10 lucky winners! Our Facebook Fridays! winners for October 23, 2015 are: Adrian Ryan, Julie Pierce, Kendra Horn, Ariana Hilario, Glenna Guidry, Shane Holden, Mark Bychowski, Valerie Rankin, Angela Sims Quinty, and Debby Harden.